Toric contact lens fitting, for the correction of astigmatism, is an essential aspect of modern contact lens practice as these days more and more patients seek contact lenses. The demand for lenses that are not only comfortable in the eye but also provide consistent and clear vision is ever present. The huge untapped potential of astigmatic or toric lenses has led to the launch of many designs making the toric contact lenses more stable on the eye. The lecture aimed to offer knowledge on various stabilization techniques available in today’s toric soft contact lenses. The modern improved designs have made toric fitting more predictable and the manufacturers have made lenses that are more reproducible. Many eye care practitioners still underutilize toric lenses, especially in low astigmats – thanks to the popular 4:1 sphere-cylinder ratio where the cylindrical element is often ignored. It is important for the practitioners not to prejudge the patients’ vision requirements and they should prescribe toric contact lenses with confidence. The session also aimed to explain how to adjust the parameters of a soft toric lens once the lens behavior is observed on the eye by using the LARS / CAAS rule. This was done with different case-scenario. An interesting part of this session was a live demonstration with the help of video slit-lamp explaining on the different reference markings of all major manufacturers and taking that as an example for explaining axis orientations on the eye. A patient, previously unknown to the presenters, was selected and the toric lens applied to the patient could be observed settling on the eye. The live workshop demonstrated the visual benefits of toric lenses over using mean spherical equivalent contact lenses or spherical powered contact lenses with an aspheric optic zone. 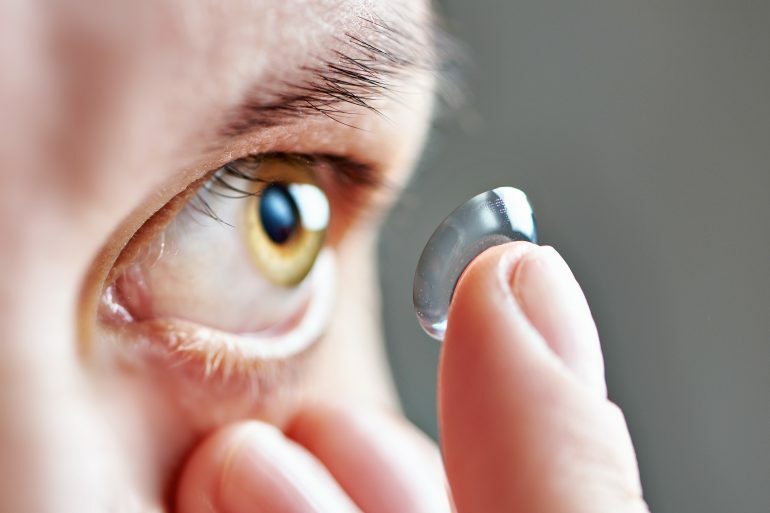 Until recently contact lens practitioners were not confident of fitting and prescribing toric lenses and often deemed them as specialty lenses. The fitting procedure of those lenses was often perceived as lengthy, difficult and complicated. Another options we could provide were Rigid Gas Permeable lenses or spherical soft lenses with equivalent spherical power. As fitting RGP lenses was challenging, many preferred the next option of spherical soft lenses. The 4:1 sphero-cylinder rule was as popular as film stars among public. Consequentially most astigmats were dissatisfied with the level of vision. The entry of disposable toric lenses changed the scenario dramatically. With their innovative designs and perfect combination of material, manufacturing technique and design they attained the heights that their earlier counterparts failed to do. Their superior quality reflected on patient satisfaction. Today’s toric CLs are comfortable and provide consistent and clear vision. So does this mean that toric lenses are prescribed regularly? Well, there are still some areas that need to be worked on. Many clinicians still tend to over-emphasize the 4:1 sphere to cylinder ratio and low cylinders like 0.75 can be overlooked. If a patient requires, -4.00 / -1.00 X 180 many clinicians will prescribe a lens with equivalent spherical i.e. –4. 50 D., after vertex correction it could probably be –4.25 DS lens. Whilst this lens may provide acceptable visual acuity in many wearers in some it will not and to upgrade to a toric CL is not a complicated matter as many toric CLs are available ‘off the shelf’. Another common myth is, low cylinders like 0.75 D can be neglected. This is the most untapped segment where the possibility to add value to our patients’ visual comfort exists. Over 45 percent of prescriptions have 0.75D or greater astigmatism, although only approximately 20-25 percent of all soft lenses fitted are torics. Of the strategies to correct astigmatism with soft contact lenses, the use of soft toric lens provides the least compromised means. Soft toric fitting has become simpler in recent years and manufacturing technology has improved so that soft torics should become an integral part of contact lens practice. The mantra for fitting toric soft contact lenses successfully has become simple!